Hey Yall! My Hannah (Rescued from a puppymill) will be in Pug talk magazine in march/april issue under the rescue section. She was going to be executed in the woods (shot) because she could no longer breed. She was from a mennonite puppymill in Upstate NY. Got her from CNY pug rescue...there are more pugs that need homes (she has 3 more not listed). she is beautiful!!! i'm rescuing my next pug...stories like this make me want to go up to those puppymills myself!! 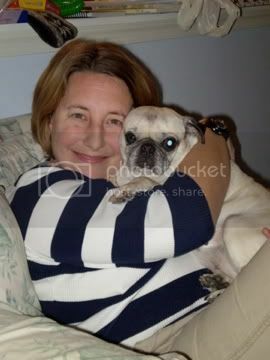 Hannah is a lucky girl, first for finding a nice person to adopt her and secondly for the Pug Talk Magazine stand out. Hannah's a beauty, Looks like hannah have met her Guardian Angle !!! & for that puppymill owner , he should be the one to have been shot !!! How could these people do something like this to such a lovely animal. That is wonderful that your little Hannah will be recognized. I did not subscribe this year. I am going to have to borrow one of my friend's copy. Thank God for people like you!!!! Congrats to you!I'm glad there are people like you outhere,you are doing a wonderful thing,you are an angel.Those people who run these so-called puppymills should all be shot,i'm hoping our laws get a little tougher.We would like to send our very best to you-you are a special angel,good luck to you both! Hi Hannah! My pug, Leon is from a rescue too and he couldn't be a greater dog. Congratulations to you and Ellen. I am so glad to learn you have found a forever home where you will have all the love you deserve. Puppy mills need to be illegal.